Last month we started a demonstration of the SuperFloc system Gujarat, India to showcase purification of ground water contaminated with high fluoride concentrations. Related institutions are invites, as well as NGO’s and social enterprises focusing on water purification. Excessive high values of fluoride are not only found in Gujarat. Also Indian States such as Rajasthan and Andra Pradesh have to deal with this issue. 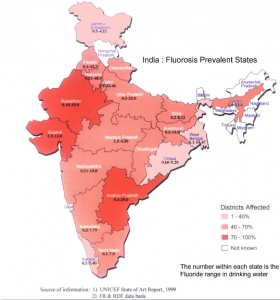 In most of the other Indian States fluoride issues are found 40%-70% of the districts. See the maps below. Outside India, a number of regions can be pin-pointed were fluoride contamination’s are also wide spread. 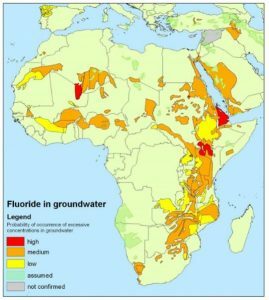 The attached map provides a rough overview of the water resources in Africa, contaminated with fluoride.